‘Future voices’ is SCCAN’s participatory podcast project. 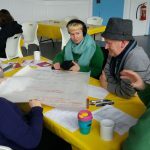 The aim is to give voice to community-led climate action -giving community activists, working on community-led, climate action projects, the skills and confidence to start using audio as a new means of telling their stories. This is a free event for community activists but places are limited and booking is essential. You will need to bring a smart phone (or other audio recorder) and a laptop for editing. Tea/coffee provided but bring your own lunch. Many thanks to Transition University St Andrews for hosting this event.